Precision CNC Machining – Valk Industries, Inc.
CNC is an acronym for computerized numerical control, and such machines are always controlled by a computer aided design and drafting (CAD/CADD) program and usually a computer aided manufacturing (CAM) program as well. When these basic software systems are combined with specialized software, precision machining services such as drilling, grinding and cutting are possible. CNC drilling, for instance, bores precise threads or holes into the surfaces of variable material composition and thickness. This technique is used for the creation and modification of furniture, shoe lasts, brush handles, boats, golf clubs and more. CNC grinding, on the other hand, uses a disc, belt or abrasive wheel to provide automated precision material removal and surface finish. CNC cutting has a wider range of tool options, although the finished product is none the less precise. A cutting machine may utilize laser, water jet, knife, flame or plasma methods depending upon the advantages and disadvantages they offer in specific applications. 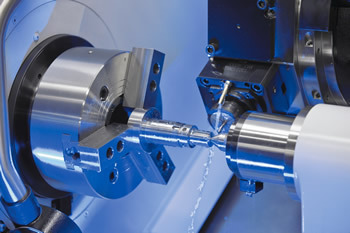 Industries that use machining include medical, dental, automotive, aerospace, defense contracting, hardware, food and beverage and many other examples. This is because precision machining, in each of its varieties, is a fast and effective way to manufacture detailed parts. Because precision machining is a highly automated process, very little worker involvement is required, which lowers the cost of the service. As long as operators load materials and make any necessary adjustments to the design parameters, precision machining equipment can run unattended for a significant period of time. However, those that do work with the machinery must have a base knowledge of both computer programming and mechanics, therefore requiring a sharp mind and steady hand. When going to a CNC machine shop, where many precision machining services are offered, assurance of a quality product can be determined by a few factors. Certification through the National Institute of Metalworking Skills is one assurance of quality, while a machine shop’s compliance with International Organization of Standardization regulations is another. Precision Machining Precision machining refers to CNC machining systems that are equipped with a computer consisting of one or more microprocessors and storage units. Precision machining utilizes specialized software in conjunction with CAD/CAM software systems to instruct the tooling to execute the exact movements necessary to create the part.